Cassia has always trusted the Society to make the right choices for her: what to read, what to watch, what to believe. So when Xander's face appears on-screen at her Matching ceremony, Cassia knows with complete certainty that he is her ideal mate . . . until she sees Ky Markham's face flash for an instant before the screen fades to black. I've been looking forward to Matched all year, and it was worth the wait and anticipation. I love dystopia, and Matched took all of my favorite dystopian elements and wound them together to make a story that I just couldn't put down. If I enjoy a story enough to sit and read while I'm having my restless leg syndrome (a wonderful pregnancy condition that happens every night at 8:00), then it's a testament to how good a book is. I started Matched and knew I couldn't go to bed without knowing how the story ended. I finished the book standing up, shaking my legs around so they wouldn't twitch. Oh, to be able to sit and read at night: I didn't even know how good I had it before I got pregnant. Anyway, back to Matched. This was more of an emotional suspense novel than an action-packed dystopia like The Maze Runner or The Hunger Games. There was not a lot of action, as much of the story was dedicated to world-building. I suspect that we'll get more action in the sequel(s). Condie does a great job building the world of the Society. The principles reminded me a lot of Lois Lowry's The Giver, a fact which ultimately kept me from giving Matched more stars. 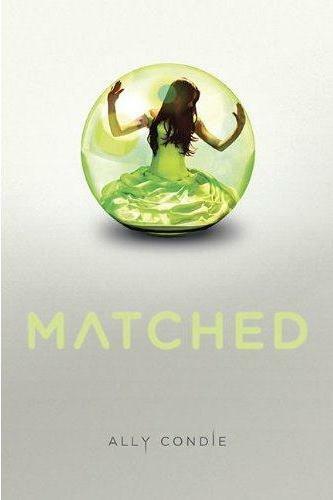 What really stood out for me while reading Matched was the attention to detail and the writing style. Condie writes with feeling, and those feelings transcend the page to work their way into your heart. If you've never tried dystopia, Matched would be a great place to start. The similarities to The Giver. I think it's nearly impossible not to compare all dystopia with classics in that genre, but other dystopias I've read set themselves apart without being too close to their competitors. The writing style. I love the way Condie writes about emotions and her characters' growth. Thanks for the review. I bought this one over the weekend and cant wait to get started on it. Ooooo sounds fantastic. I LOVE when a book grabs me like that. Any book that reminds me of The Giver is AWESOME!!! I didn't love this one, but I did really like Condie's world building and writing style. Overall, this one moved a little slowly for my tastes, but I'll still check out the next book for sure! Nice review Kelli, I adored this one! It's definitely hit or miss for most people, but it was a hit for me. I loved Cassia and Ky and I can't wait to read more! I've read over and over again how Matched compares with The Giver, but I have yet to read the latter to compare. Must do so soon. Matched touched my heart too. I'm glad you enjoyed it. Oh, hun. I wish I could relieve your legs for you. I totally would. I loved this book. I can't wait for the next book in this trilogy to come out. Talk about a cliffhanger ending! I'm glad you liked this one :) I agree, it had some similarities with The Giver. I have this one on the shelf ... will let it sit there a bit since I have others to catch up on before. Thanks for the heads up but tell me... don't you love the cover too.